In the future people will say “where were you when they elected Donald Trump as president of the USA?”. I was feeding my dogs lol. These are exciting times we live in right? I remember when President Obama was elected for his first term, I was at university for the first time (check my experience page to see what I studied the second time). I missed Christian Union to watch it (which I later went on to be a Co-President of in my 2nd year of university. There were two presidents that year me and a guy and we worked as a team!). There was soooo much red, white and blue everything and loads of glitter! I recorded his inauguration from TV, it’s taking up a bit of space on my external hard drive, that’s several hours of footage I have somewhere… lol. People were soo happy! I remember the news anchor on Sky actually said and I’ll never forget this… “If there’s ever a time to be an American today’s the day!…”, I think he really meant it. These are surely amazing times when an African American can be the president of the most influential country in the world. That meant that for just under a decade an African American man was leader of one of the most important and influential countries in the whole world. Martin Luther King Jr. & Sr. would have been very proud 🙂 . What an amazing and bizarre presidential race it’s been? 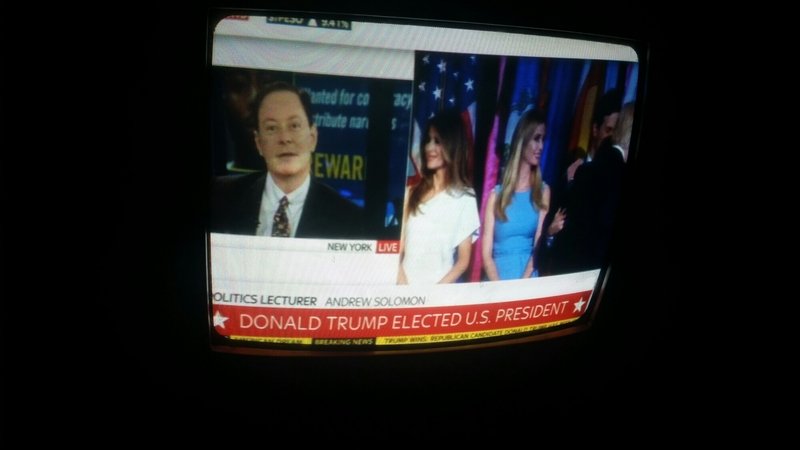 Now we have Donald Trump! With Hillary Clinton conceeding this morning. I didn’t sleep I was literally up alllllllll night! That’s a picture of my TV lol. I did not expect this result personally, here at catherinewaithe-arnold.com HQ (heh) we were rooting for Hillary! I’m glad that there are still countries that allow the people to have a say in how their governments are run and who runs their governments. When a vote happens it happens and thats it and I accept that and so should everyone else. I believe in Jesus and that He has my best interests at heart so I’m not afraid. I hope the American people continue to move forward and that the divisions which were created during the toxic presidential campaign are healed.